This is a bold statement! Everyday Best Pricing - find a price that beats our pricing and at Fitness Depot we will ALWAYS beat that price for identical items, provided that item is in stock. See terms and conditions below. In Stock Inventory - at Fitness Depot our goal is to keep all items in stock year round. If you want it we have it! With 25 stores [and growing], and a continent wide wholesale business we have lots of inventory. 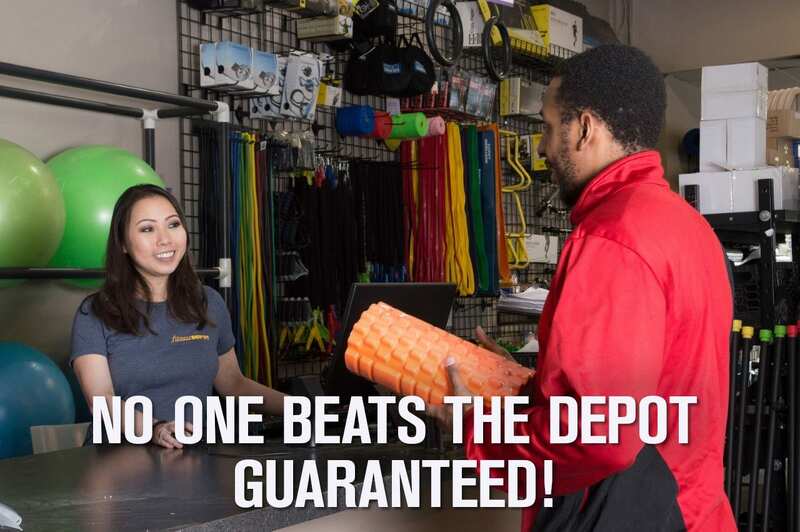 At Fitness Depot we may not have every item in every store every day – but we do guarantee it’s in one of our Fitness Depot warehouses. So on the rare occasion that you have to wait for us to move the product to a store near you at our cost, rest assured the product will be moved expeditiously. This does not apply to end of line product or product close outs. Knowledgeable and Passionate Sale Associates - at Fitness Depot our amazing sales team is the face of our corporation. The interaction between consumer and our sales team is how we are perceived in the fitness industry. We love our sales force and are immensely proud of our people. Their passion for health and fitness is what clearly sets us apart in our industry. Just give them a chance to “Wow” you, we guarantee you will be impressed. How Our Price Guarantee Works? Our Price Protection Policy guarantees that if you find a current lower competitor’s price online, in-store, or in print before your purchase we’ll match the difference immediately. Should our own price be reduced, present us with your original receipt within 30 days of purchase and we will match the price and refund you the difference. Identical products with the exact same brand name, make and model number. Must be priced in Canadian Dollars, sold and shipped by a retailer and authorized dealer located within Canada. Does Not Apply to franchise locations (Kanata, Ottawa, Quebec City or Sherbrooke), Fitness Depot's online pricing, or competitor's website pricing. Any seller who sells refurbished or liquidated products. If you've already made your purchase in-store you should make your request at any Fitness Depot Corporately-owned store. Ensure the identical product is in-stock at the competitor. Remember to present the flyer, advertisement, printout of the lower-priced product with you as well as your original receipt. We will confirm if the product qualifies and if it falls within the 30 day price protection period.